A major new piece of 3D art, believed to be one of the largest of its kind ever produced in the UK, has been unveiled at Brewery Wharf and has become an immediately recognisable landmark on Leeds city centre’s riverside. The street art, adopting a technique known as anamorphic or forced-perspective art, has been created by renowned Leeds based artist Ralph Replete, who has produced a wide range of mesmerising artworks throughout the City of Leeds over the last 20 years. A video game artist by trade, who has worked on Nintendo games, Ralph has also been named in a list of the world’s 15 best street artists by GQ Magazine and recently participated in the renowned touring art exhibition, Magic City. His latest work, known as Washing Marine, depicts a deep-sea diver climbing out of a washing machine that is laid on its side. Ralph was commissioned by Leeds based property group Rushbond Plc. The Leeds based real estate group owns and manages Brewery Wharf and Ralph was given total freedom of expression to create a unique piece of artwork to adorn the side of one of the buildings at Brewery Place. Georgina Maud, creative lead at Rushbond, said: “This type of 3D, anamorphic street art is an optical illusion that is both mesmerising and addictive to look at. Ralph has a reputation for creating works that take into consideration the surroundings, communities, and overall characteristics of what makes a place unique. He’s previously produced several fantastic large-scale pieces of art in the communal areas of our Crispin Lofts apartment development, which have become a real focal point for residents there, and we’re delighted to collaborate with him again on this latest project. 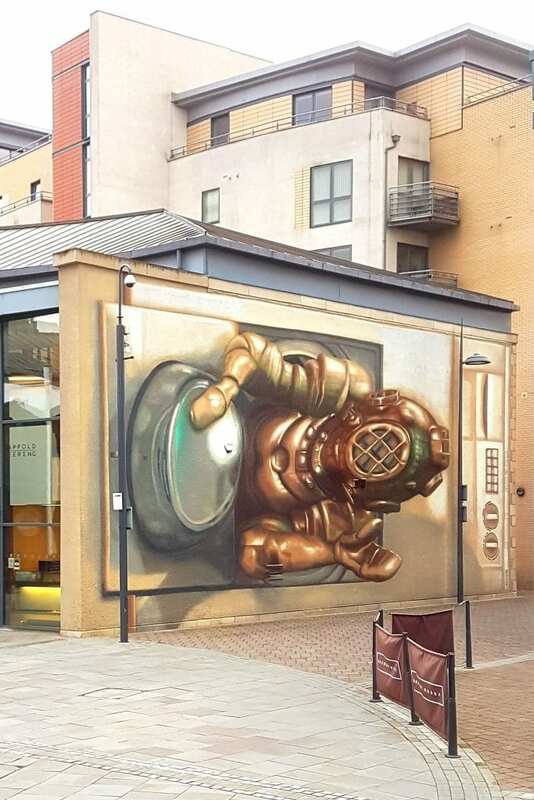 “This piece of art exposes Ralph’s full potential on a national level and gave him the opportunity to respond to Brewery Wharf as he saw it – the result is a playful take on domesticity in the context of waterside living in the city centre, with a diver coming out of an everyday household appliance. The result transforms a simple wall into an immersive environment with substantial volume”. Georgina added: “It now acts as a marker as part of the growing collective around the South Bank and the inspiring design further helps to strengthen Brewery Wharf’s unique identity as a key waterfront location in Leeds”. Ralph said: “I considered lots of ideas for Brewery Wharf, but the shape of the wall, the surrounding residential apartments and the waterfront, paved the way for Washing Marine. As far as I’m aware, it’s now the biggest 3D, anamorphic work of its kind anywhere in the UK and I’m delighted with how it looks”. Brewery Wharf was one of Leeds city centre’s first true mixed-use developments and offers apartments, workspaces, a food store and a hotel along with public sculptures set within the streets and spaces. The development has also established a reputation as a destination that offers some of the city’s best and most unique independent bars and cafes.